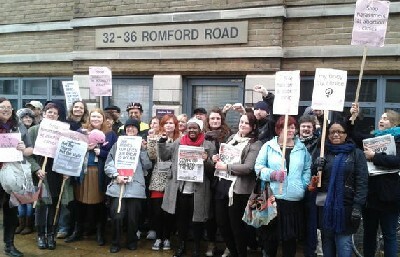 Pro-choice protesters braved damp weather on Saturday morning to show their support for the BPAS clinic in Stratford, east London. The clinic, on Romford Road, has previously been targeted by anti-abortion groups. Around 40 enthusiastic pro-choice demonstrators stood outside the clinic, while an anti-abortion delegation led by a clergyman had to position itself further down the street – and further away from the clinic. It is thought that SPUC was also involved in the organisation of the anti-choice protest. The clinic is closed on Saturdays, so no patients were affected by the protests. The protest started at 9.30am, and continued until 11.30am, when the anti-abortion group left the area. Pamela Corr, who runs the Stratford Pro-Choice group, and who helped to organise the pro-choice counter-protest, told the assembled protesters that defending abortion rights is becoming more and more important, as the threat posed by anti-abortion activists continues to grow, with groups such as Abort 67 using tactics imported from the US. She added that the success of the day’s counter-protest was highly encouraging, and that any future anti-choice protests outside the BPAS clinic would be met with spirited resistance from pro-choicers in Stratford.